TOKYO, June 4, 2012, Japan Display Inc. (JDI) (President: Shuichi Otsuka), a leading provider of LCD technology, today announced that it has developed a world-class liquid crystal display (LCD) in the direct-view panel field that features a resolution of 651ppi (RGB pixel pitch:39μm). Although the screen size is only 2.3-inches, the resolution format of the display is 1,280 × 800 pixels (WXGA), which is comparable to those used in typical notebook PCs. From another perspective, the resolution format of the newly-developed display is nearly twice the resolution of today’s high-resolution smart phone displays. In response to this growing requirement, the resolution of this newly developed display is about twice as high as that of smartphone displays of the highest resolution that are being currently manufactured by JDI. The new JDI ultra-high definition LCD with 651ppi resolution enables realistic and high-quality images that are comparable to film-based photographs. 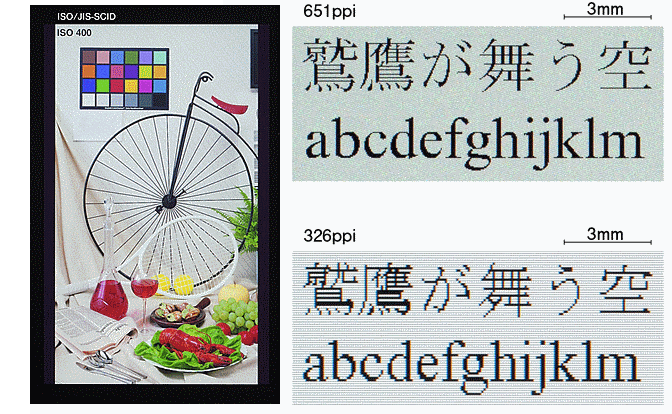 Furthermore, when compared to low-resolution displays that hindered by jagged lines and characters, this ultra-high resolution display enables exceptionally clear lines, letters and characters approaching typographic quality levels. JDI has conducted an ergonomic study to evaluate the benefits this high resolution screen may have for the human visual perception system. Based on our study of the sensory evaluation of letters appearing on this screen very good results were achieved, which confirm that an ultra-high-definition display with 651ppi has utility as a man-machine interface.